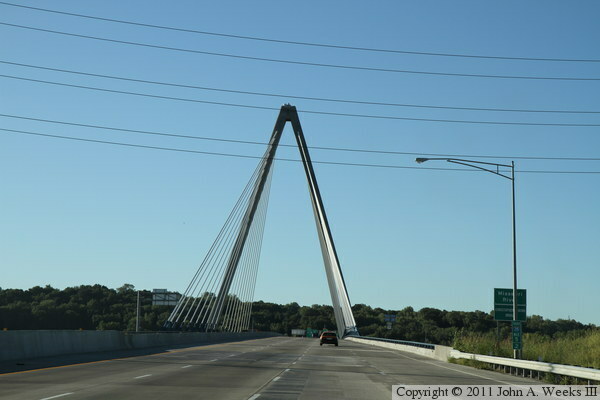 The original bridge crossing the Missouri River at this location on the north side of Kansas City was known as the Paseo Bridge. It was built between 1952 and 1954. This 1,232 foot long self-anchored suspension bridge was the longest of its type when built. On January 22, 2003, the deck of the Paseo Bridge jumped up 8 inches, blocking the bridge to traffic just before the busy afternoon rush. Inspectors found that a plate had fractured. The cause of the fracture was traced to a seized connector pin that was supposed to allow the bridge to move slightly during heat and cool cycles. 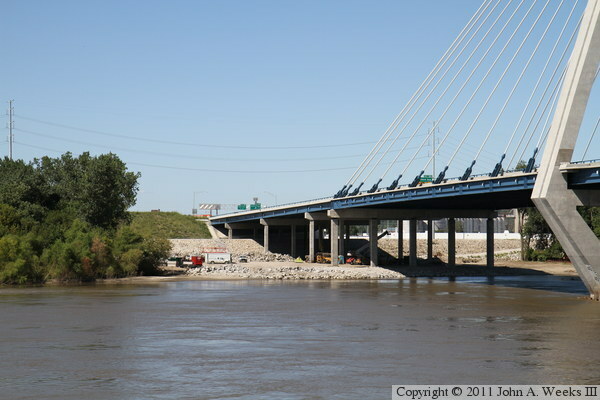 An emergency repair was completed and the bridge reopened 10 days later. 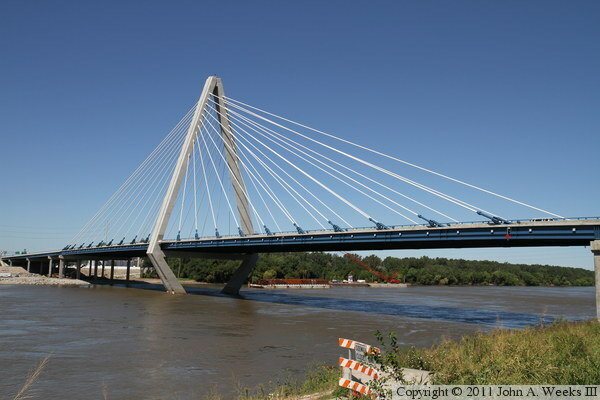 MO-DOT planned for a major rehabilitation of the Paseo Bridge during the summer 2005. Just after that project started, it was learned that Congress had set aside funds to replace the structure with a new bridge. As a result, MO-DOT significantly scaled back the rehab, doing just enough work to extend the life of the bridge 5 more years. 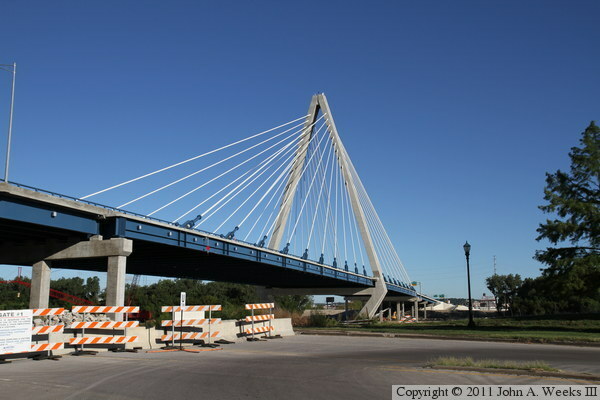 The Paseo Bridge reopened after being closed for 3 months. 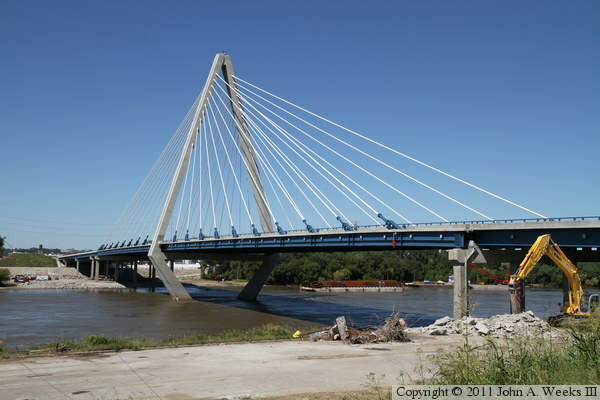 The replacement bridge, originally known as the New Paseo Bridge, would be built as a design-build project. That is, to speed up the project, the design and construction would run concurrently rather than waiting to start building the bridge until after the design was fully complete. It seems like design-build would be a little more risky, but in practice, it produces excellent results in a much shorter timespan than the traditional approach. The project team consisted of a group of 5 companies with long histories and a recent portfolio of nationally significant bridge projects. This included Clarkson Construction, Massman Construction, Kiewit Construction, Parsons, and TranSystems. The youngest company of the group, TranSystems, had been in business over 40 years. Together, they operated as the Paseo Corriro Constructors. 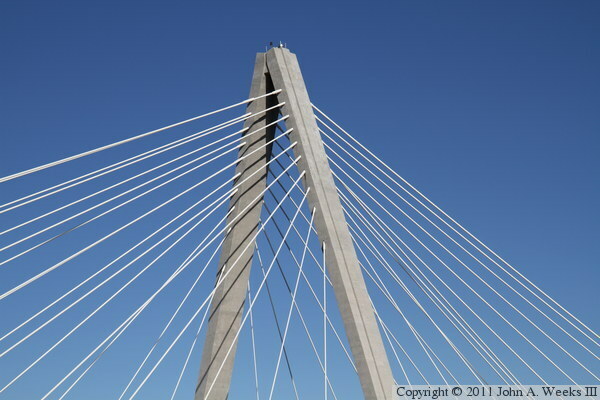 The project concept started as a single tower cabled stayed bridge that would be a signature structure for the Kansas City Area. Construction kicked off on April 18, 2008 with a goal of being complete by July 31, 2011 and a contract penalty date of October 31, 2011. 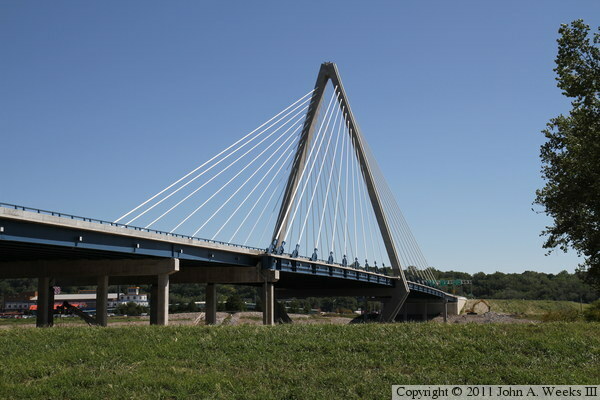 The main bridge would feature a 316 foot tall triangular tower with 7 lanes of traffic running between the two tower legs, 4 northbound and 3 southbound. The tower would support 40 stay cables which would suspend two steel girder spans. The north span would be 451 feet long, while the south span over the Missouri River navigation channel would be 550 feet long. 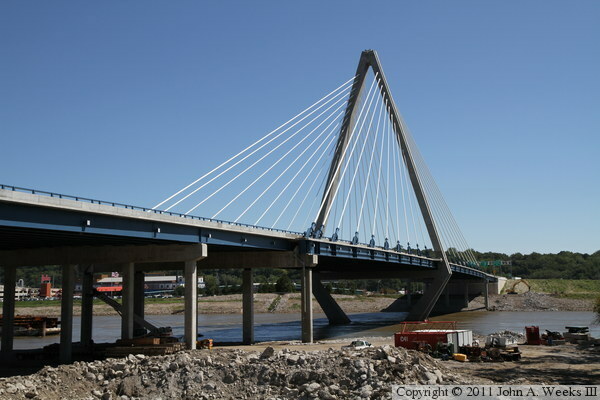 Despite the spans being different lengths, each span would be held up by 20 cables, 10 on each side of each span. That makes the bridge slightly asymmetrical, but the asymmetry does not stand out until you take a very close look at the bridge. 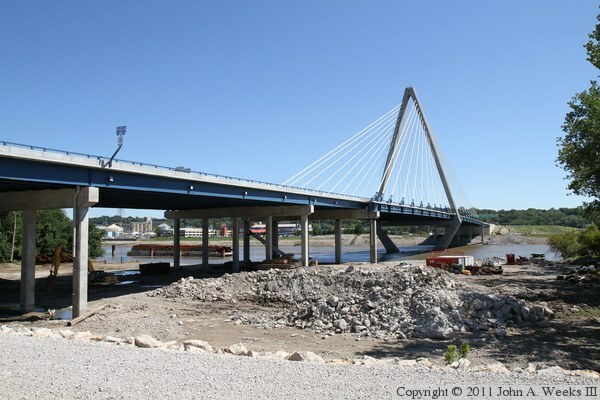 In order to keep traffic flowing, the new bridge was built just downstream from the old Paseo Bridge. Some approach lanes and ramps had to be moved to accommodate the construction, but 4 lanes of traffic continued throughout the project. 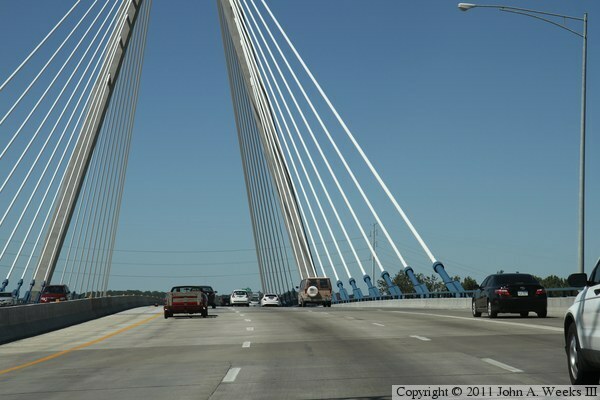 The first lane of the new bridge were opened on September 27, 2010, with the final lane of the new bridge being opened on December 18, 2010. The Paseo Bridge was closed at that time. The US Army Corps of Engineers required that the old bridge be removed within 90 days of being closed. There was local talk of saving the old bridge, but it would have to be moved, and that proved to be impractical. As a result, the old bridge was dismantled starting in November, 2010, and continuing through the spring and summer of 2011. The steel was removed first, then the concrete piers and abutments were demolished. Only a small amount of rubble was present when I visited the site in early September, 2011. That is impressive work when considering that the Missouri River had a record high flood in 2011 that forced the river to be closed for several months during the spring and summer. The Kansas City area is composed of a large number of population islands where moving from island to island is all but impossible on foot or bicycle due to both natural and man-made barriers. This was underscored when a bicyclist was killed attempting to cross the Paseo Bridge northbound on the morning of May 25, 2009. A local movement to ‘Put People On The Paseo’ put pressure on MO-DOT to add a bicycle lane to the New Paseo Bridge. For a period of time early in the project, a bicycle lane was part of the design concept for the new cable stayed bridge. 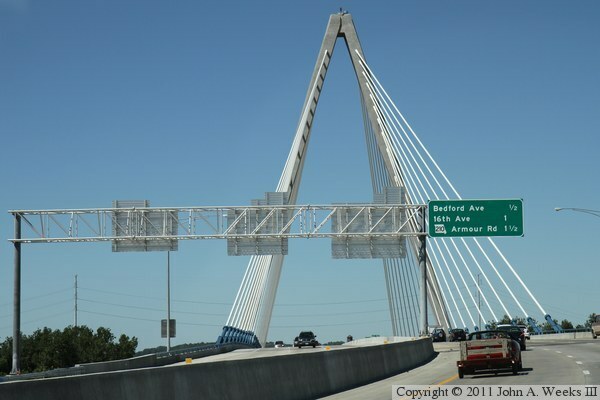 But after extensive studies, MO-DOT came up with an alternate plan of adding a bicycle lane to the nearby Heart of America Bridge and keep the Chris Bond Bridge limited to Interstate highway traffic. MO-DOT had planned a 5 year time frame for the bicycle lane, but again, local pressure caused that project to be moved forward. Construction started on March 31, 2010, and the bicycle lane was open later that year. In addition, a plan was moving forward to add barrier-protected bicycle lanes to the Chouteau Bridge. 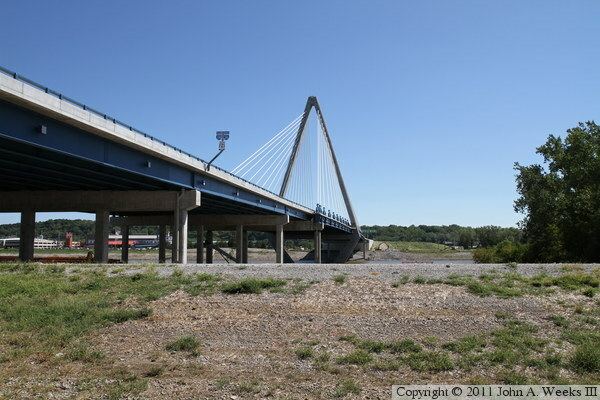 The photo above is an afternoon view looking northeast towards the upstream west face of the Christopher S. Bond Bridge from halfway up the embankment that once supported the south abutment of the Paseo Bridge. The trackhoe on the near side of the river is cleaning up the last remains of a concrete bridge pier that once supported the south end of the suspended portion of the Paseo Bridge. These two photos are looking south across the Missouri River along the upstream west face of the Christopher Bond Bridge. 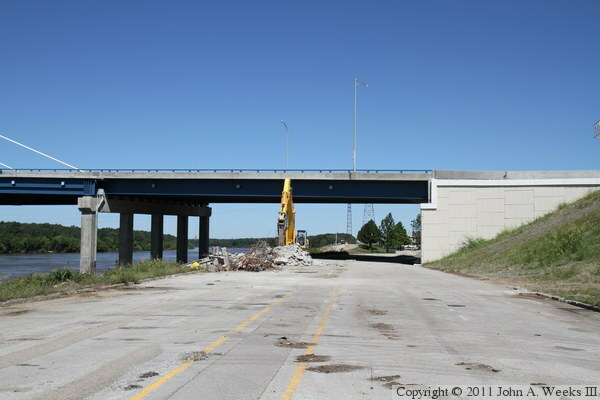 The photo above features the main bridge spans, while the photo below is a wider view that shows the demolition work that is still in progress in late 2011 on the Paseo Bridge. The river flats area was underwater earlier in the year, which delayed the demolition of the bridge piers. 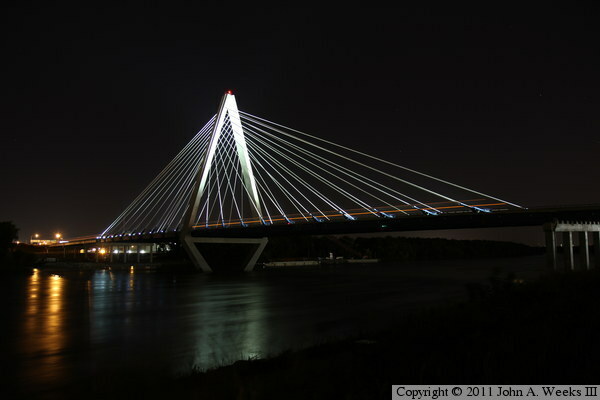 These two photos are night views of the Christopher Bond Bridge as seen from the south riverbank. A series of cannon lights illuminates each cable as well as the bridge tower. There is also a series of LED panels that run the length of the bridge, but they are only turned on for special events. The photo above is a shorter exposure that shows the true appearance of the bridge to the naked eye. The photo below has a longer exposure that shows more detail. In addition, it happened to catch a well lit semi truck as it was crossing the south main bridge span leaving the trail of orange light. 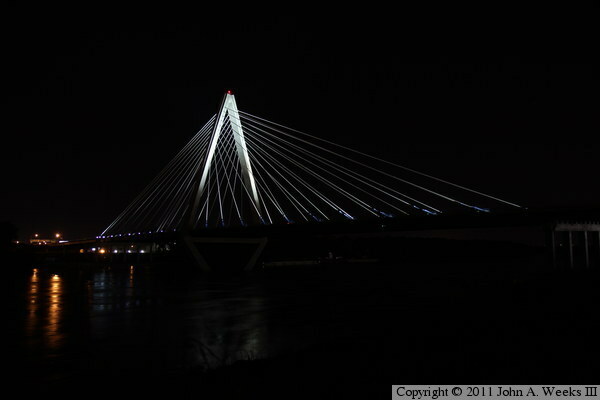 The bridge was lit for the first time on July 3, 2011 at 10 PM just prior to the KCRiverFest fireworks. These two photos are the north bridge abutment. The photo above is the east side, while the photo below is the west side. The street passing under the bridge is Levee Road. 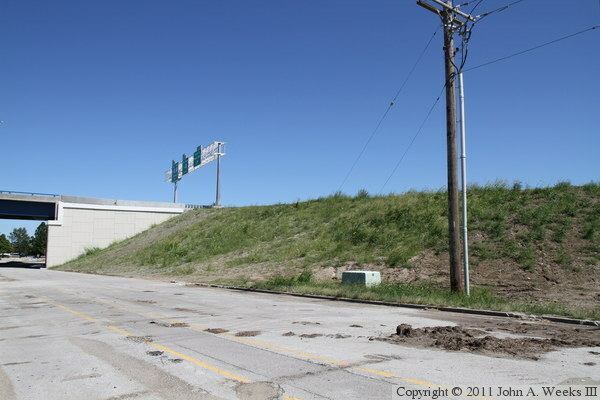 This segment of Levee Road is used to access an industrial park to the east of the Interstate highway, and as a result, it does not run along the top of the levee. The fence to the right blocks access to the levee, which is closed for most of the length of the north side of the Missouri River in Kansas City. 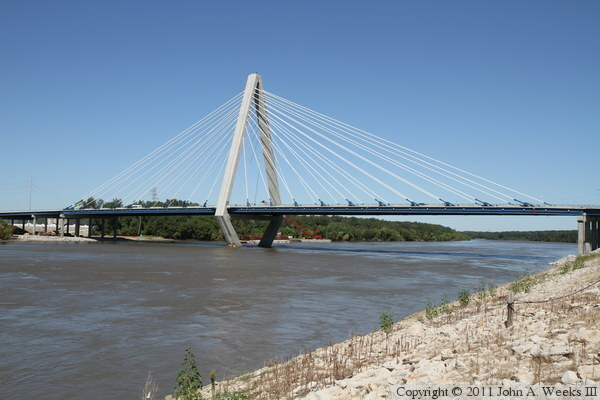 The photo above is the bridge span passing over the levee on the north side of the Missouri River. 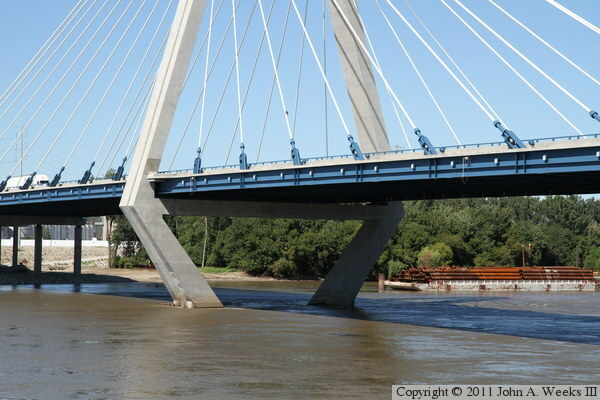 The photo below is one of two spans that passes over the river flats on the north side of the river. The square LED lighting fixtures are visible along the length of the steel bridge girders. 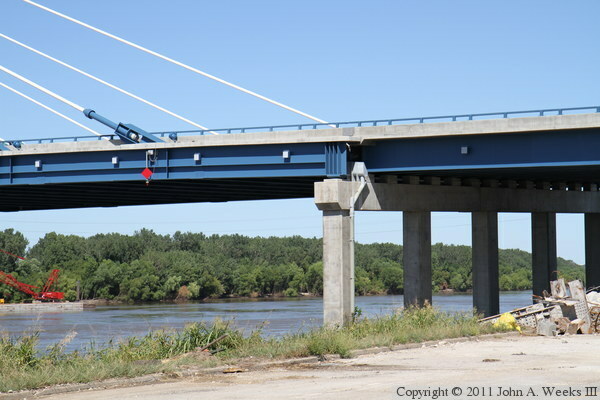 These two photos are views looking south across the Missouri River along the upstream west face of the bridge. The vantage point is Levee Road, with the levee blocking the view of the river channel. 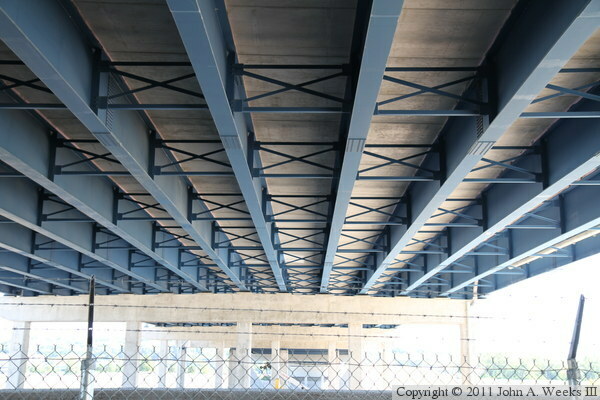 These two photos are views of the underside of the bridge. 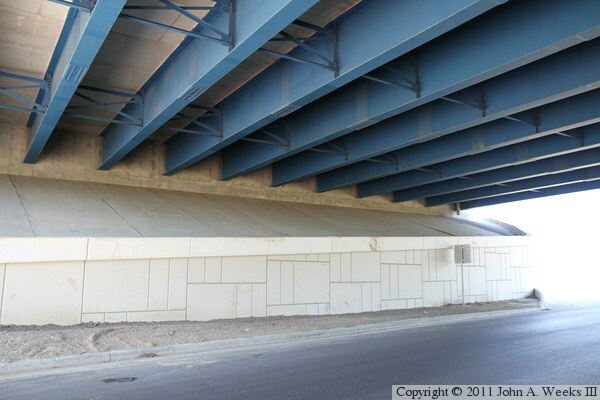 The photo above is the underside of the bridge at the north bridge abutment. 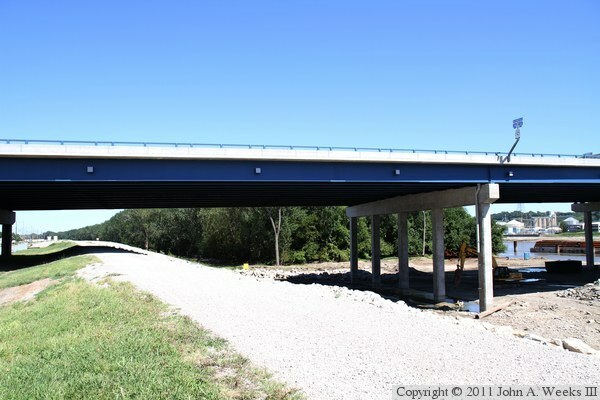 The photo below is the steel girders as the pass over the levee on the north side of the river. These two photos, and the four that follow, are views from the Isle of Capri Casino property located southeast of the bridge. The photo above is looking north across the Missouri River along the downstream east face of the structure from the overflow parking lot. 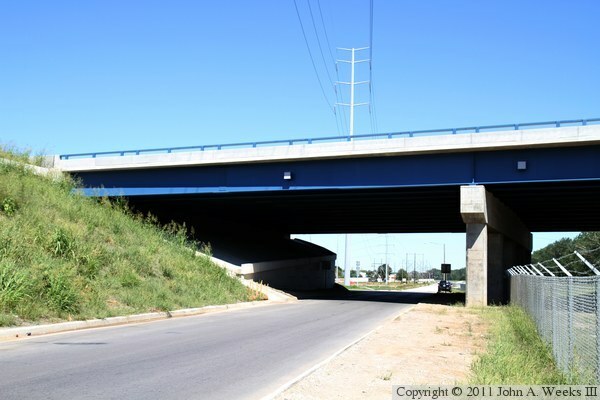 The photo below is the first bridge span at the south end of the bridge, which crosses Lydia Avenue. These two photos are additional views of the bridge from the Isle of Capri property located southeast of the Christopher S. Bond Bridge. The photo above is looking north across the Missouri River from the edge of Lydia Avenue. The photo below is a similar view from the Riverfront Heritage Trail, which ends on the Casino property. These two photos are additional views from the Isle of Capri property. 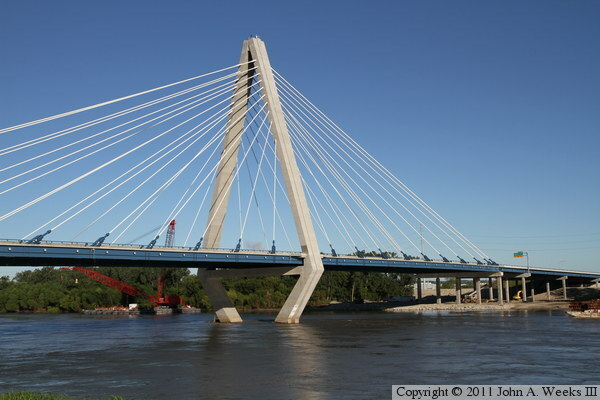 The photo above is a closer view of the main bridge tower as seen from the edge of the Missouri River. The photo below is an even closer view of the top of the tower where the stay cables are attached. These two photos, and the eight that follow, are views from the Richard L. Berkley Riverfront Park located southwest of the bridge. 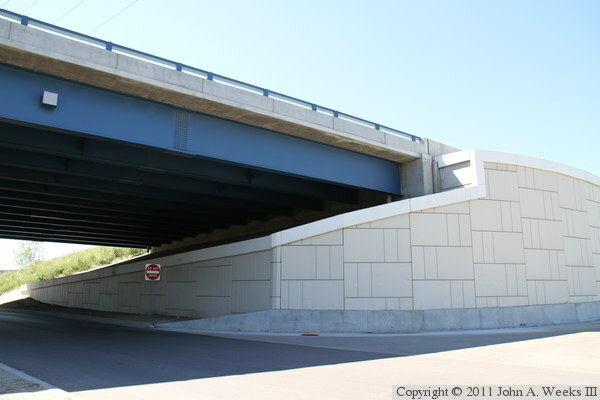 The photo above is the south bridge abutment. The Paseo Bridge abutment was located between the power pole in the foreground and the abutment for the new bridge. The photo below is looking east along Lydia Avenue where it passes under the southernmost span of the Christopher S. Bond Bridge. The track hoe is cleaning up the last debris from a bridge pier from the Paseo Bridge. These two photos are additional views from the riverfront park located southwest of the Christopher S. Bond Bridge. 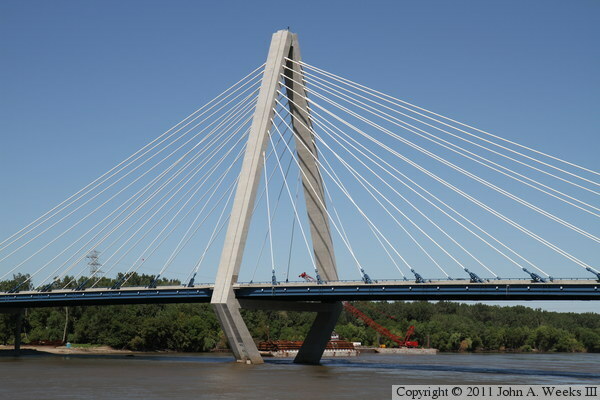 The photo above is the only bridge pier located on the south side of the Missouri River. 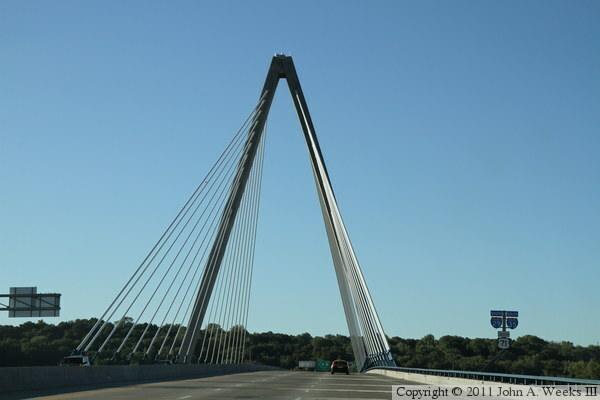 At this location, the bridge transitions from being a steel girder bridge to the first cable stayed bridge span. The photo below is a view of the base of the main bridge tower. The white boxes located along the side of the bridge are LED light panels. These two photos are additional views from the riverfront park located southwest of the Christopher S. Bond Bridge. 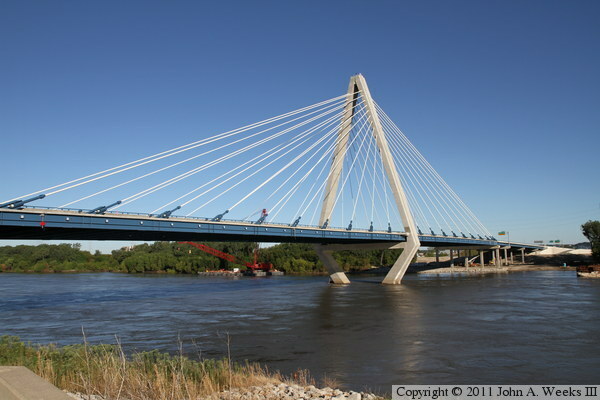 The photo above is a view of the north suspended bridge span and the steel girder spans on the north side of the Missouri River. 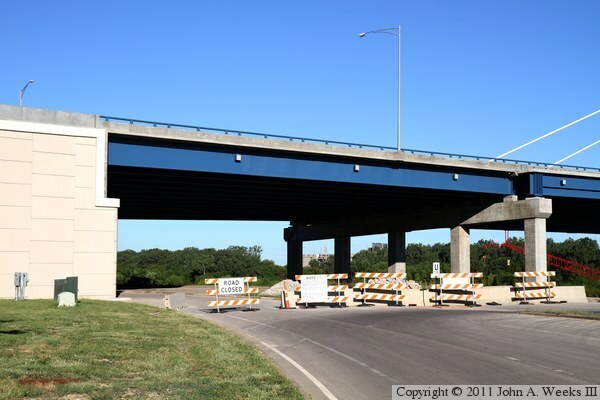 The construction project is the final stages of cleaning up after the demolition of the Paseo Bridge. 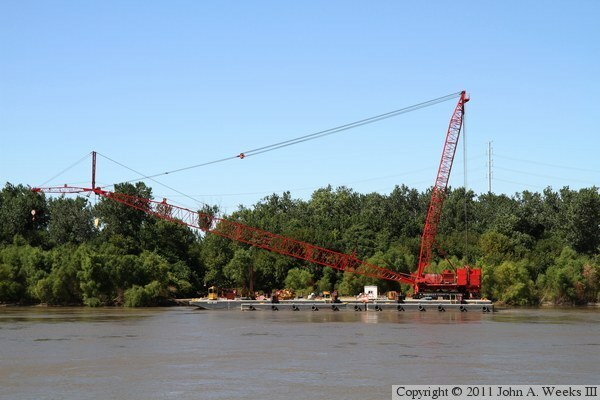 The photo below is a large construction crane sitting on a barge. This crane is a Manitowoc 7000 ‘ringer crane’. The base of the crane sits on a large steel ring, which allows the crane to rotate while carrying a very heavy load. 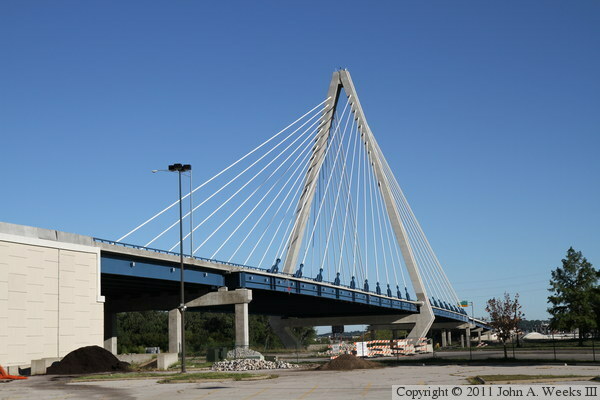 The crane was shipped in from Holland via the Port of Houston for topping off the main bridge tower, but was also used for removing the steel from the Paseo Bridge. These two photos are additional views from the riverfront park located southwest of the Christopher S. Bond Bridge. The photo above is another view of the main bridge tower as seen from Lydia Avenue just west of the structure. The crane sitting on the barge just downstream of the bridge is a Manitowoc 2250. 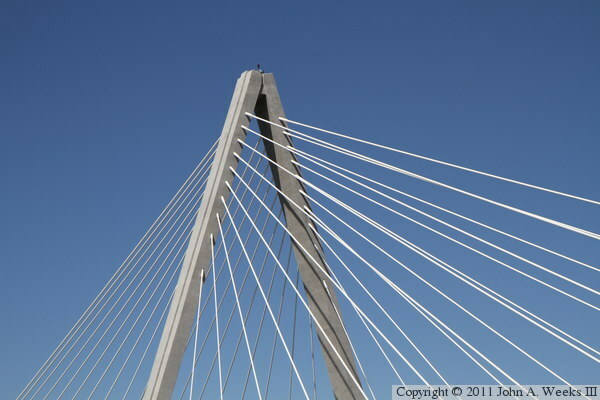 The photo below is a close view of the top of the main bridge tower where the stay cables are attached. These two photos are additional views from the riverfront park located southwest of the Christopher S. Bond Bridge. The photo above is looking northeast from the Riverfront Heritage Trail, which passes under the south end of the bridge. The photo below is a view from the south bank of the Missouri River, which is lined with rip-rap. 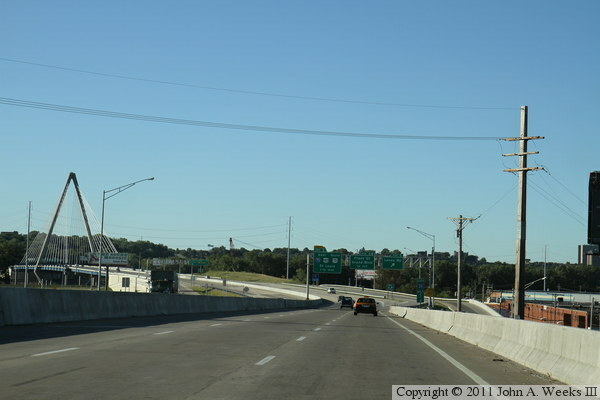 These two photos, and the four that follow, show a typical bridge crossing heading northbound on Interstate highways I-29 and I-35. 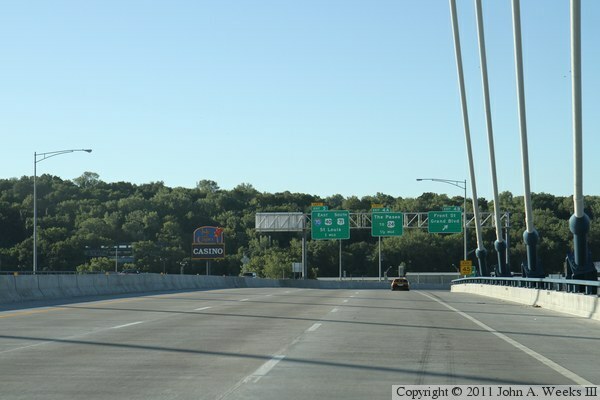 The photo above is traveling downhill from the river bluffs as we cross over Dora Street approaching Exit 4. The photo below is crossing Front Street. 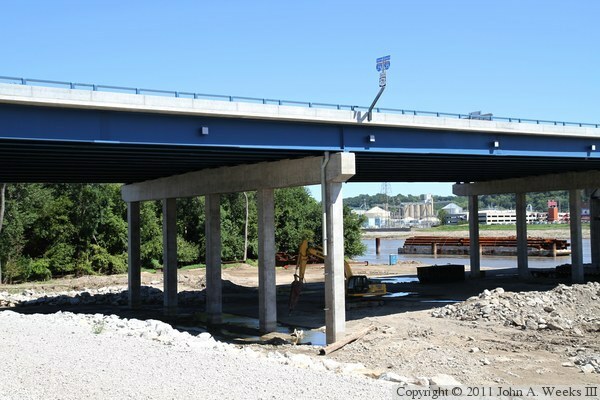 These two photos continue our northbound bridge crossing. 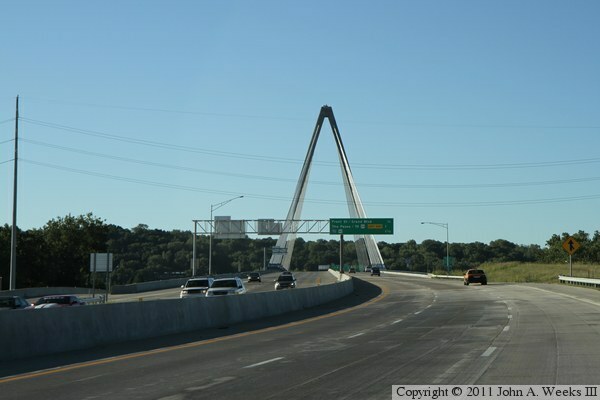 In the photo above, we are rounding the banked curve leading to the south end of the Christopher S. Bond Bridge. In the photo below, we are just entering the south end of the structure. These two photos continue our northbound bridge crossing. 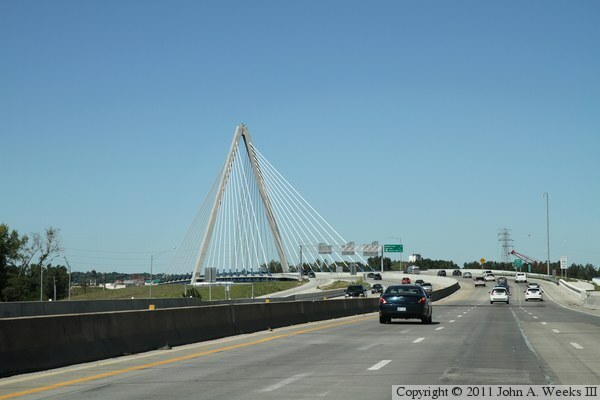 In the photo above, we are crossing the south main bridge span, while in the photo below, we are crossing the north main bridge span and heading into North Kansas City. 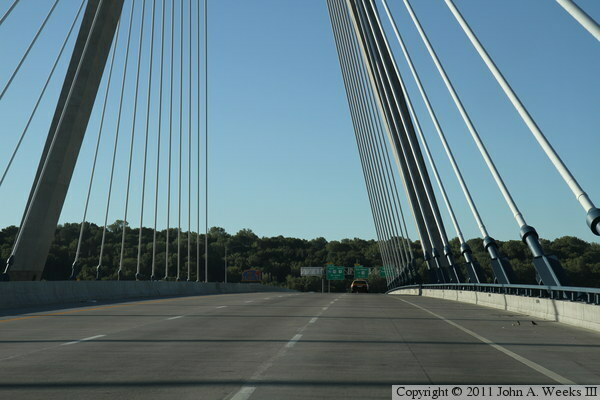 These two photos, and the four that follow, show a typical southbound bridge crossing on a bright summer morning. 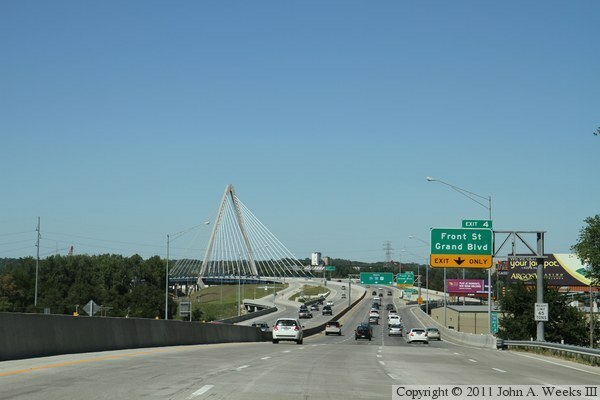 In the photo above, we are traveling southbound on Interstate highways I-29 and I-35 through North Kansas City towards the Missouri River crossing. In the photo below, we are making a slight curve to the left as we approach the bridge structure. These two photos continue our southbound bridge crossing. In the photo above, we are approaching the north end of the bridge, while in the photo below, we have entered the bridge and are crossing over the steel girder spans. These two photos continue our southbound bridge crossing. 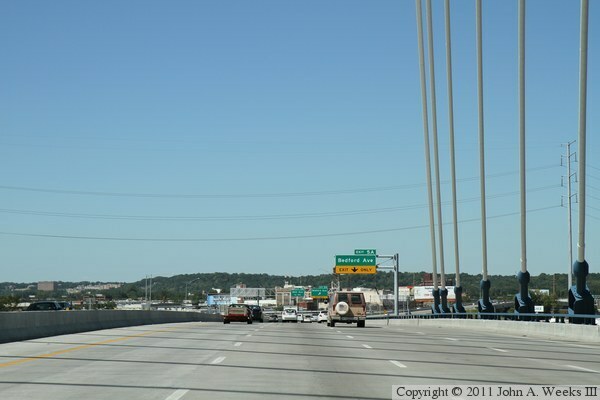 In the photo above, we are crossing the north main bridge span, which is the shorter of the two suspended bridge spans. 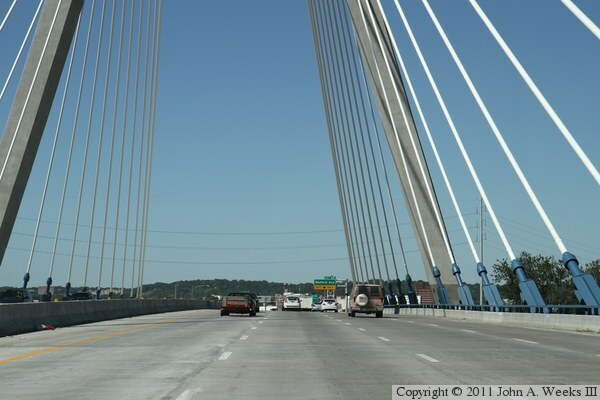 In the photo below, we are crossing the longer south main bridge span.